Turn back the clock just a little bit. About a year, to be exact. This is our archived page of the top-ranked Catchers in fantasy baseball in 2015. Believe it or not, you can use the stats below to help solidify your draft picks in 2016, or you can use them to convince yourself not to draft "that guy after all. You can't be too careful, and you don't want history to repeat itself... unless you ended up with the steal of the draft at the Catcher position last year. There were a lot of surprises at Catcher in 2015 as you'll see, below. 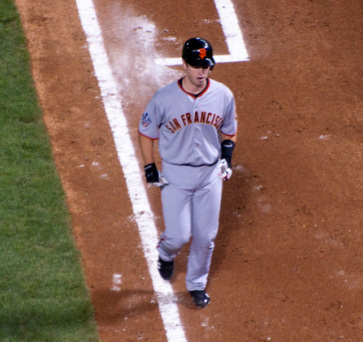 Buster Posey proved to be the top fantasy catcher in 2014 and there's no reason to think he won't do it again in 2015. You know how we do things here at Fantasy Baseball Brass and that we take things a step further with our fantasy baseball rankings. We don't just give you stats and walk away - we give you insight into the stats that actually make a difference to your team's success. For instance, when we ranked the top fantasy Catchers for the 2015 season, we pretty much ignored the stolen bases category. We're here to help you on draft day, and the best way to do that is to give you insight into the categories that are going to help you win. We're not saying that stolen bases don't matter, but let's face it: you're not going to look at a Catcher's stolen bases on draft day, so neither did we. Stolen bases from a catcher are gravy - blind, stupid luck, even. When you think about it, there are 26 weeks in the season. Jonathan Lucroy, Russell Martin and Carlos Ruiz led all catchers with 4 stolen bases apiece in 2014. That's 1 every 6 weeks or so - not significant enough to help your team with any possibility of prediction. Therefore, we present to you for starters) the top 25 fantasy Catchers based on their 4x4 fantasy stats, stolen bases excluded. Of course, look around the page for more stats that matter, too. Below are some more stats that can help you predict a player's fantasy value. While these aren't standard 5x5 fantasy stat categories, they can be extremely helpful in predicting what a player might do in 2015. For instance, Russell Martin finished third among all fantasy catchers with a .290 batting average, yet he only finished 13th among catchers with 166 total bases. While total bases isn't a standard fantasy stat, his lack of total bases tells you that he slaps a lot of singles around and he isn't in scoring position as much as you might like, so he's not likely to score a lot of runs. It also tells you that his RBI total of 67 last season was probably an anomaly. In 2014, 20 total batters had between 65-70 RBI. Among those 20 players, the average Total Bases for them was 217. Russell Martin was the worst among those 20 batters with just 163. This tells us that, in the real game of baseball, he's pretty clutch. In fantasy terms, he's not likely to have as many RBI this season. However... let's say that Russell Martin went to a team that was suddenly stacked on offense - even more than the Pittsburgh Pirates were last season. Might his RBI remain? Might his Total Bases skyrocket in a more hitter-friendly park and an even more ridiculous lineup around him? Might he score more runs simply playing station-to-station baseball with a plethora of power hitters around him? He might... he just might. Check out the stats below and use them as fantasy stat indicators that the other guys in your draft won't know about.